Our mentor / facilitator training is experiential and interactive, providing objective data and information related to the restorative justice philosophy and practices. Our aim is to inform and inspire while creating a supportive community that will continue after the close of this formal training. The training is considered an introductory course to provide volunteers with the basic knowledge and awareness to confidently engage as mentors and facilitators. To view the steps to becoming a mentor, click here. Prepare volunteers to begin to effectively serve as mentors, community observers and/or facilitators by developing a knowledge base of Restorative Justice philosophy and familiarizing volunteers with the various programs of the project and their purpose. Emphasize the importance of establishing nurturing, supportive, non-judging relationships between mentors, and mentors and participants so as to effectively facilitate relationship building and positive changes. 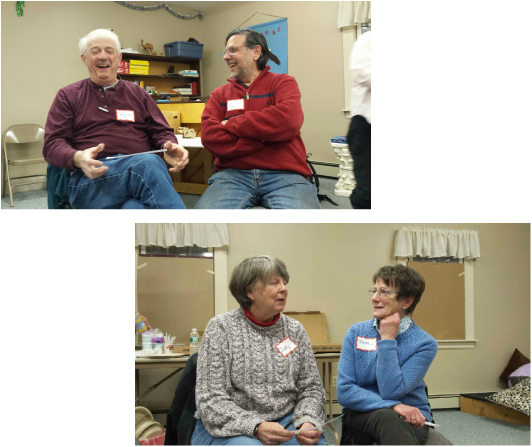 Provide role modeling and tools to assist new volunteers in identifying, appreciating, and developing their strengths and the strengths of the participant they are working with. Serve to create a foundation for a supportive community through the use of circles where mentors, facilitators and participants feel free to express themselves for the purpose of working together and learning. Demonstrate the importance of bridging restorative practices to the community, corrections, and law enforcement building on our commonalities to unite in our effort toward creating a cultural shift in the community’s response to crime and wrong doing.